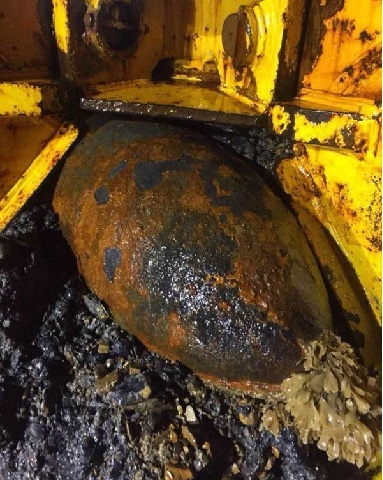 Portsmouth, United Kingdom A WWII bomb containing 290 pounds of high explosives was discovered in the Portsmouth harbor by a dredging vessel. Divers from the Royal Navy's Portsmouth-based Southern Diving Unit 2 responded and deemed the ordnance to be of high threat. All ferries were stopped and trains between Portsmouth and Southsea station and Portsmouth Harbour were suspended while experts towed the munition, identified as a German SC250 bomb, out to sea for controlled detonation. Divers from the Royal Navy's Portsmouth-based Southern Diving Unit 2 responded and deemed the ordnance to be of high threat.